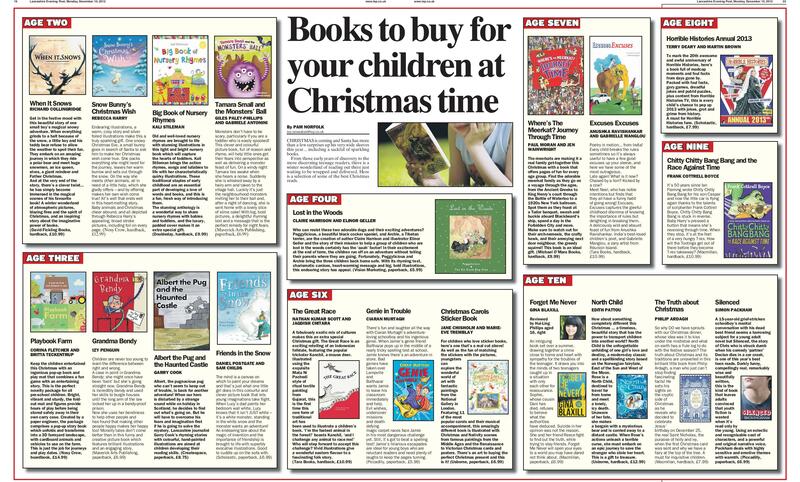 A lovely review from the book reviewer at the Lancashire Post who has classified Peggylicious ‘Lost in the Woods’ as a book to buy your child this Christmas. Lisa Houghton and Tracey Park, speech and language therapists and founders of Talking Tots, UK’s leading children’s communication programme. What a beautiful book with wonderful illustations. My 3 and 4 year olds love it and can’t wait for the next story. Fantastic. Absolutely love this book! I read it to my 3 year old grandson over and over again. He loves the illustrations and the way it’s written in rhyme. Peggylicious is a great children’s book for all ages, even the ten year old in our house loved it. The book is a great size to pop in your bag and take out for the day as we are always looking for short stories to take out in the car. Coming Home is the story of giving a dog a home and the fun the family have. We all loved the paw prints on the pages and the description of the all too familiar “we will love it and walk it and feed it” which my girls laughed at. As they don’t like to take our dog out when it’s raining.The pages are beautifully illustrated and capture the attention of everyone. I would recommend this for all children even if they don’t have a dog. My youngest daughter has taken Peggylicious to pre-school in her bookbag for everyone to read. We can’t wait for the next adventure of Peggylicious and the Do Good Dog Clan. What a delightful children’s book with great dialog and artwork. There is a very strong message for children in this story: ALWAYS let mom or dad know where you are going and with whom! These children were so very lucky to have Peggylicious and Archie come to their rescue; such good, loving dogs! Another benefit to this series of children’s books is that on each page there are two words highlighted; obviously for definition if needed, but also for children to practice their writing skills in print or in cursive. I don’t think there is another series that offers so much! I have received the children’s book Coming Home Peggylicious and The Do Good Dog Clan by Claire Harrison with illustrations by Elinor Geller to review. It tells the story of a little girl, her Mum and sisters who go to buy a little dog from a farm. Although her Mum says that they are just going to take a look who could resist the big bright eyes of a little black puppy dog and soon they are on their way home with the new addition to the family. They decide to call the little puppy Peggy hence the Peggylicious title. I particularly loved the line the little girl says ‘Forever more a part of us,’ as dogs certainly do become part of the family and are not just for Christmas. Peggy’s favourite toy is a squeaky Christmas Pud which she loves to run and chase after. This toy also leads to a new friend for Peggy to share her future exploits with. I really enjoyed this book as it is easy to read to a child or for them to read themselves, it has highlighted words in big letters such as ‘please‘ and ‘squeaked‘ which are great to be read out loud and with extra feeling to keep a child captivated. The book is also wonderfully illustrated with bright colourful pictures that will hold a young childs interest and help slightly older children to keep turning the pages to read about Peggy. This will make a wonderful stocking filler for a child and giving a book for a present is great way to encourage children to read. I look forward to the next instalment of Peggy’s adventures in subsequent books.